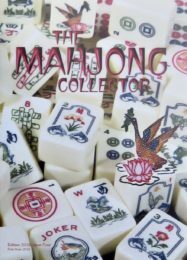 (1) The purpose of this site is to provide information about the Mahjong tile set for interested collectors, researchers and students of the game, as well as anyone who would like to know more about a tile set in their possession. (2) In the Navigation Bar across the top of this page you will see links to the major sections of this site. These links are described below to help you navigate this site. Please read these descriptions before you proceed. (3) Immediately below this Quick Introduction is a News section where you can catch up on current additions, as well as the latest events happening in the world of the Mahjong tile set for researchers and collectors. (4) At the bottom of this page I have given a brief synopsis of, and Useful Links to, other web sites devoted to the tile set. Mahjong, Mah Jong, Mahjongg, Mah-Jongg, Mah Jongg, Majong, Ma Jong. Ma Que 麻雀, Ma Qiao 麻雀, Mah Diao, Peng Hu 碰和, Mah Tseuk, Mah Cheuk, Ma Chiang 麻將 and Ma Jiang 麻將. Update. Completed the next page of Tony Watson’s MJ collection Gallery. See under Private Collections. Added another set to Garland Price Gallery. See under Private Collections. 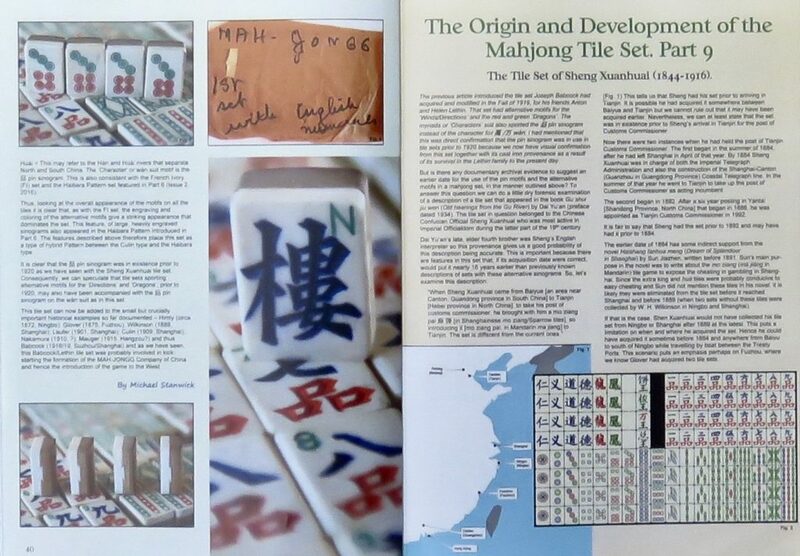 In the article The Origin and Development of the Mahjong Tile Set. Part 10, page 44 and 45, in the latest issue of The Mahjong Collector magazine, there is an error in the 2nd paragraph. Figures 5-8 do not have Arabic numerals and therefore the penultimate sentence in that paragraph should have been omitted. Out now is the final edition of the Mahjongg Collector magazine. See below for details. Additional pictures have been added to the Flowers and Kings article in the Tile Set History section. These represent reconstructions of 2 types of tile set present in the North and South of China at least by 1942. They are unique representations of a game that used many Flowers. 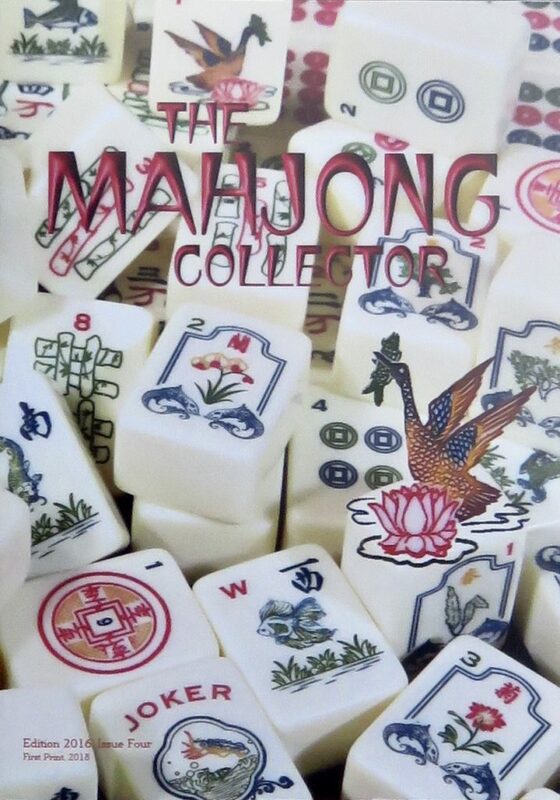 The 8th and final issue of The Mahjong Collector is out now! 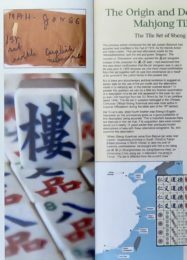 This final issue features photographs and analyses of boxes and tile sets – including a newly engraved tile set by Dee Gallo called the Shanghai Water tileset. 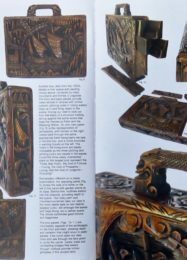 Also included is an interview with a guest collector Bill Price that details some of his sets plus illustrations of various tile racks, photos and table top and books under the title Bits and Bobs. 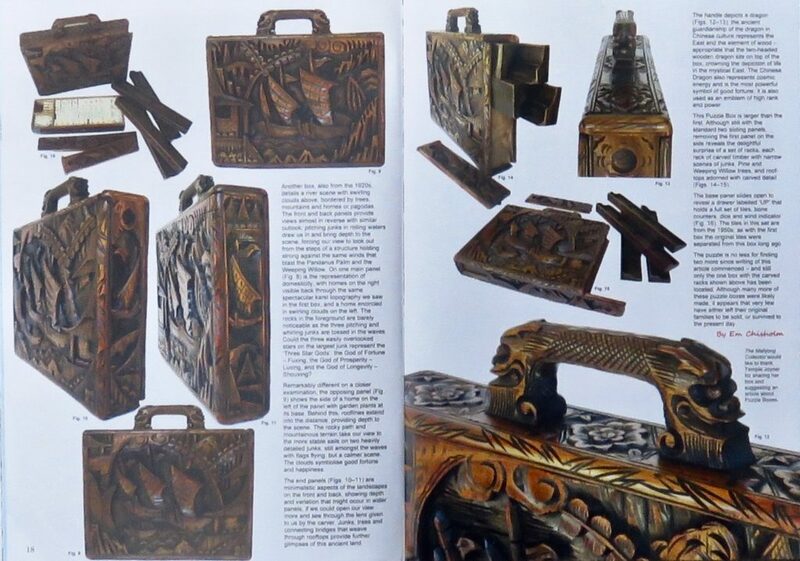 Pictures of a Mahjong Puzzle Box and three articles of Mahjong History are also featured. Replete with images in full colour and accompanied by authoritative texts this is an issue not to be missed! Presented below are four images taken from the latest issue. For enquiries please use the Contact button at the top of the page. The early appearances and developments of the tile set are presented in eight articles using documentary evidence, with pictures of key tile sets – among them the earliest so far discovered and documented. Six of these articles originally appeared in The Playing-card, the Journal of the International Playing Card Society. The last article argues for a link between the suits of early Chinese playing cards and the suits of the early mo ziang tile set (what became known as Mahjong). Another link may also be found in the names used for an 18th century card game and the 19th century mo ziang game, and this is discussed in the next article ‘máquè/májiàng/Mahjong terms 1780-1920’. The discussion in this article also highlights the geographical spread of the card game of máquè and the tile game of mo ziang as well as identifying the social conditions and the social vectors that aided that spread. This article documents the introduction to the West of one of the most popular versions of the Chinese game of 麻雀, má qiǎo (sparrow(s), má què in modern Pinyin). This introduction is explained via the fortuitous meetings of J. P. Babcock, A. R. Hager and A. N. Lethin and their formation of the Mah-Jongg Company of China, of San Francisco and the Continental Mah-Jongg Sales Co., – as well as their patents and trademarks. This article is thoroughly referenced throughout and also features photos of the individuals mentioned above. This section describes and illustrates Chinese money-suited playing cards from which the tile set suits most probably were derived. Some of these examples date from the 19th century. Also featured is an example of a Late Qing four suited ma diao deck. A brief introduction describes the construction and explains the meaning of the names of the individual suits. Gallery 1.0. Tile sets that share the same structure as the Himly/Glover sets (1868 – 1876). Gallery 1.1. Tile sets that share the structure of Wilkinson/Laufer sets (1889 – 1901). Presented here, in three categories, are illustrations of key research documents and texts, including additional books on Chinese symbolism and character translation for the novice. Also included are examples of the booklets commonly found with tile sets exported from China, as well as some of the earliest key texts and manuals in English. This Gallery contains a small selection of Tile Racks composed of mainly wood – either plainly painted or lacquered or painted and lacquered with intricate designs overpainted into the paint or lacquer. Also featured are Racks of a very simple design and made of metal and varnished wooden Racks of complex construction. This site is run by James Peirce. Highly recommended. This site showcases examples from the collection of a European collector. The examples highlight materials, locations and companies that produced tile sets. Easy to navigate with a mouse-over zoom facility for the tile set displays, accessories and books. A comprehensive resource for those interested in the many card and tile games from around the world. Highly recommended. 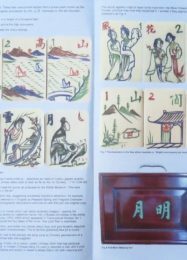 My website is about Playing cards (and Dominoes) of Chinese origin and their variants in South East Asia. The playing cards are presented by type and by country. Decks : browse the decks classified by type and sub-type. Cards : see the variants of a specific card through all the decks. Patterns : browse the different patterns. References : identify the decks cited in 3 major references of Chinese playing cards. Regions : see in which region the different decks are used. Explore : explore the different type of decks. For those who don’t speak Chinese, Vietnamese, Thai, and English (like me!) : they can specify their preferred language … when available, texts will be translated ! Click on the link below and select ‘Banknotes’ from the menu provided. This will take you to the money-suited playing cards to which mahjong/ma jiang belongs. Explore this excellent site for other cards and for a breakdown of card development. An excellent pictorial site that hosts some good examples of Chinese Playing cards. This important site provides access to Culin’s major contributions to Chinese games and, in particular, to his 1924 paper on Mah Jong. Also featured is a paper that describes Glover’s 1875 tile set. Sir W. H. Wilkinson’s paper form the 1885 American Anthropologist Journal. 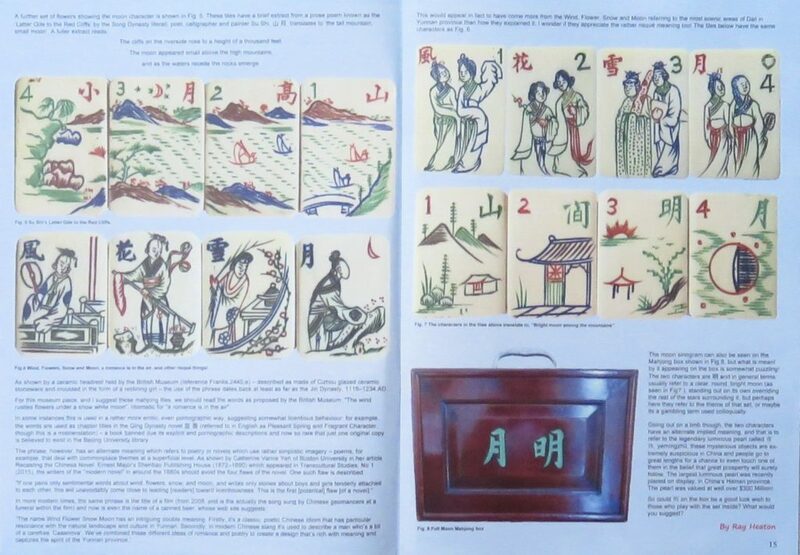 This is one of the earliest papers in English that deals with Chinese money-suited playing cards, and provides an insight into the probable link between these cards and the Mah Jong tile set. A website showcasing mahjong sets, with interpretations of the art on the tiles, racks and boxes. Translations of the Flower tiles, and the stories behind them will also be featured when appropriate. When possible, sets will be placed in their historical context. Submissions of photographs and ideas for articles are welcome. Tile Sets/Missing Tile Replacements/Joker Stickers/Helpful Hints etc. This site has a Museum containing examples of many types of tile sets and their boxes. Also available is a facility to help people replace missing tiles and acquire “simply the best” joker stickers, as well as a service for making stickers for missing tiles – if an exact tile is not available from the site’s owner. There is a section where people can identify the label of a typical American set and also included are some helpful hints on buying and cleaning tiles. Tile sets are also for sale from time to time. Answers to Frequently Asked Questions/Bulletin Board for Collectors & Players. Please note that I hold the Copyright to all material on this site. If you wish to use or quote any material please feel free to ask me and, if granted, credit me in the appropriate reference. I constructed this web site to disseminate the knowledge it contains to those interested in the subject. Please feel free to donate to help me maintain this service.